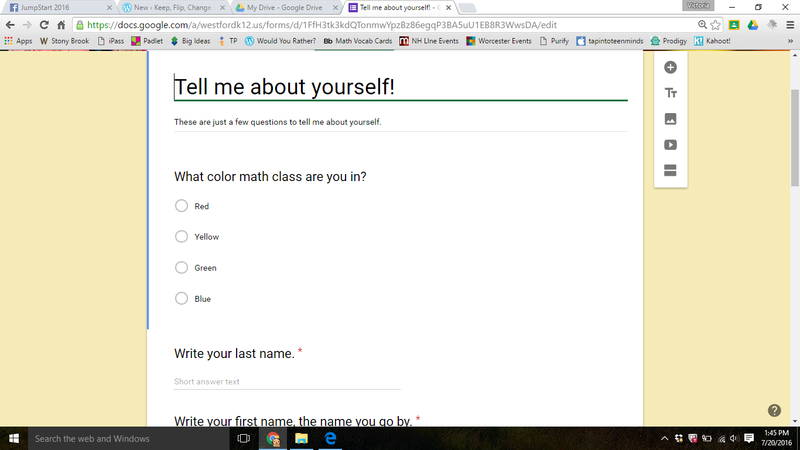 I knew about google Forms before, but took this opportunity to learn more about it. I was also encouraged that it has some features now to make it more appealing to look at. I have seen this took used in my school before for pre-tests, post-test, and just some homework checking. I love all those uses and now that I see how easy it is to use it, I like it even more. I made a form to gather some information from the students the first week of school. I will have the students join my classroom and then fill out this form. We will also log into the math textbook site while we have the chromebooks that day. Best laid plans! I hope all that can get done in one 50 minute period! Previous Previous post: Module 5, Twitter, ugh, what could I possibly have to say? Keep, Flip, Change Blog at WordPress.com.